Spectra: High-resolution spectroscopy indicating that Nova Oph 2018 is a Fe II-type classical nova was obtained by E. Aydi et al. 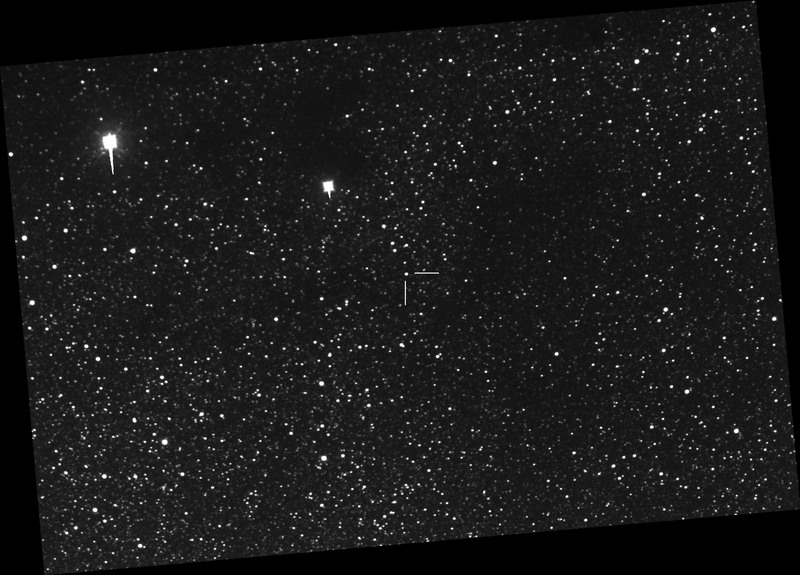 (ATel #11338) on 2018 February 23.127 UT during the South African Large Telescope (SALT) Large Science Program on transients, using the High Resolution Spectrograph mounted on SALT. Spectroscopy by M. Yamanaka, M. Kawabata, and T. Nakaoka (Hiroshima University) on Feb. 21.8 UT using the 1.5-m Kanata telescope (+ Hiroshima One-shot Wide-field Polarimetry at the Higashi-Hiroshima Astronomical Obesrvatory also indicates the object being an Fe II-type classical nova. They reported that their spectra were were possibly consistent with the outburst event of the progenitor emission-line star (Kohoutek and Wehmeyer 2003, AN 324, 437). Observing recommendations: Observations of all types (visual, CCD, DSLR, spectroscopy) and multiple bands as instrumentation permits are strongly encouraged as the nova evolves. Dr. Koji Mukai (NASA Goddard Space Flight Center) recommends that observers use B, V, and I filters if possible to enable studying any color changes. Charts: Charts with a comparison star sequence for Nova Oph 2018 may be created using the AAVSO Variable Star Plotter (VSP). Submit observations: Please submit observations to the AAVSO International Database using the name NOVA OPH 2018. Once a GCVS name is announced in an IAU Circular or CBET, please use that name. a. Designated PNV J17244011-2421463 when posted to the IAU Central Bureau for Astronomical Telegrams Transient Object Confirmation Page (TOCP). 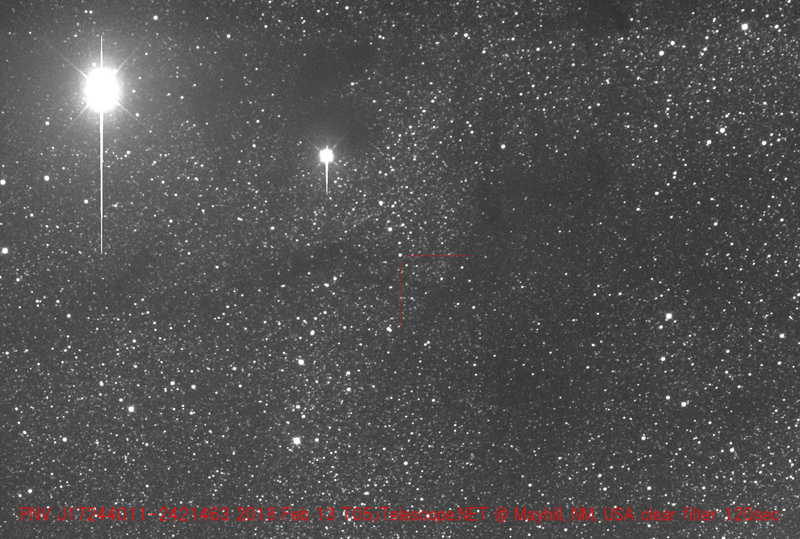 Unless otherwise noted and except for observations reported to the AAVSO, the information in this Alert Notice is taken from IAU CBET 4489.
b. Kojima writes that nothing is visible at the nova's location down to magnitude 12.0 on an image taken 2018 Feb. 8.844 UT, nor on an image taken 2017 Apr. 27 UT. c. Kojima reports a star (mag = 15.6) at position end figures 39.95s, 47.0". - T. Kojima (2018 Feb. 12.834 UT, discovery): 40.11s, 46.3"
- K. Yoshimoto (2018 Feb. 13.521 UT): 39.93s, 47.4"
f. H. Maehara reports that, according to the ASAS-SN light curve, the outburst of this variable started in 2017 September (light curve at: https://asas-sn.osu.edu/light_curves/bd9f4922-8561-4b5c-a04c-fab2c03dfa94), and notes that the object is listed as an H-alpha emission-line star (KW 011 519-33) by Kohoutek and Wehmeyer (2003, AN 324, 437). Congratulations to Tadashi Kojima on his latest discovery!